Srinagar, April 15: The convoy of former Jammu and Kashmir chief minister, Mehbooba Mufti, was attacked in Anantnag on Monday. 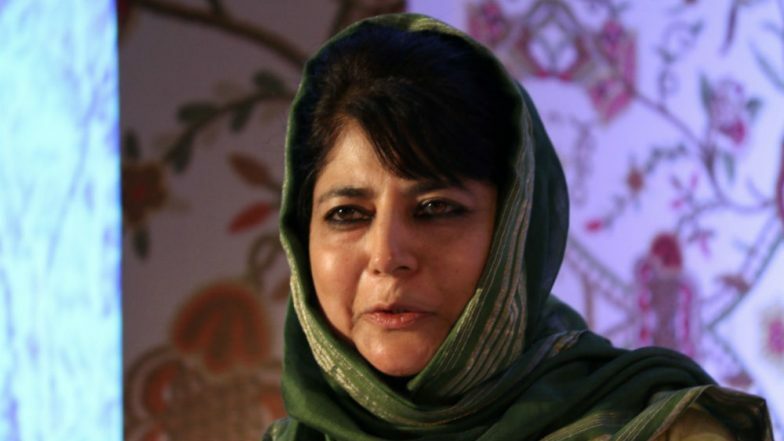 According to initial reports, Mehbooba Mufti's convoy was pelted with stones by unknown men. The People's Democratic Party (PDP) chief escaped unhurt in the attack. Mufti was returning after paying obeisance at a dargah in Khiram village when some people stoned the cavalcade which was on way to Bijbehara town in Anantnag district. A vehicle was damaged in the incident but security forces immediately cordoned off the area to provide a safe passage to the PDP President, sources told news agency IANS. Mehbooba Mufti, Omar Abdullah Hit Back With Old Photos After PM Modi Levels Anti-India Charge. Last week, Maoists targetted a convoy of the Bharatiya Janata Party (BJP) in Chhattisgarh's Dantewada district. BJP's lone legislator from Chhattisgarh's Maoist-affected Bastar region, Bhima Mandavi, was killed along with four policemen in the attack. All the killed security personnel were from District Reserve Group.